The Bureau of Labor Statistics said on September 5 that the U.S. economy had added 142,000 jobs in August - an eight-month low - despite a falling unemployment rate of 6.1%. Two weeks later, the Federal Reserve maintained its guidance that interest rates would stay unchanged for a “considerable time”. It continued, however, to scale back its quantitative easing program by another $10 billion with plans to conclude it in October. While the mid-yield on the 10-year Treasury rose 16 basis points over the course of the month to close at 2.51%, the mid-yield on the very short term 1-month bill entered negative territory at -0.001% on September 9 and finished the month at 0.008%. ECB president Mario Draghi unveiled long-awaited stimulus measures for the eurozone on September 4. These included further cuts to key interest rates, and the launch of asset-backed securities and covered bond buying programs in October. The Italian 10-year benchmark bond mid-yield dropped 21 basis points from 2.47% on September 3 to 2.26% on September 5 – a fresh low – before finishing the month slightly higher at 2.36%. Mid–yields on 10-year government debt also fell to new lows in Spain (2.05%) and Greece (5.51%) on September 5, as well as Ireland (1.61%) on September 8. Eurozone inflation slowed to 0.3% in September pushing the euro to a two-year low against the dollar at month-end. In a politically eventful month, the French socialist government survived a confidence vote on September 16, sought by prime minister Manuel Valls to subdue dissent within the ranks of his party. Three days after the vote, former president Nicolas Sarkozy announced he was re-entering the political scene by bidding for the leadership of the conservative party. 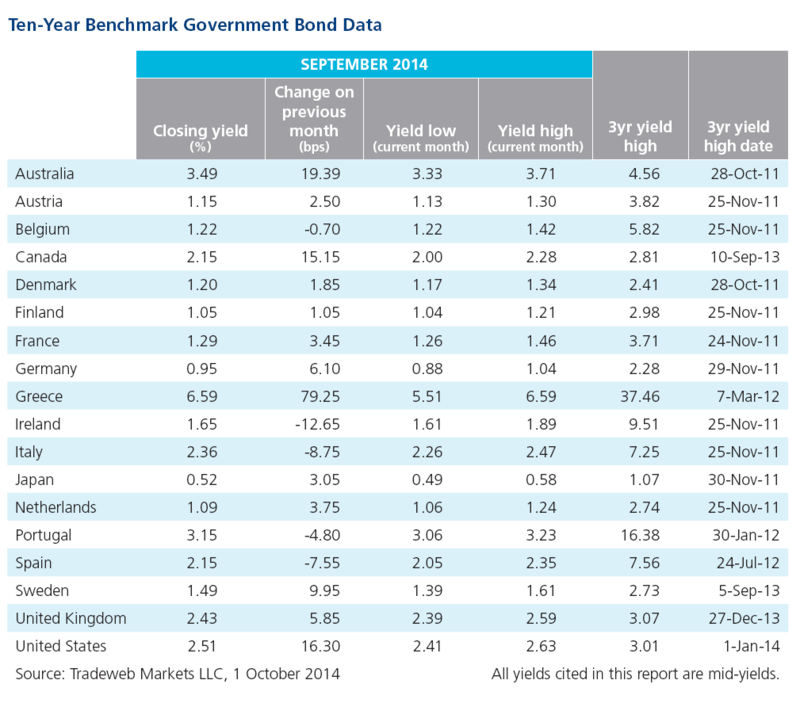 The French 10-year bond mid-yield peaked at 1.46% on September 18, a month-to-date increase of 21 basis points. On the same day, Scotland decided to remain in the United Kingdom with a majority of 55% to 45%. Having climbed 22 basis points from the start of September to close at 2.59% on the day of the referendum, the yield on the UK 10-year gilt finished the month lower at 2.43%. Meanwhile, two-year government bond mid-yields for seven European countries closed in negative territory during the course of the month. While German two-year bond mid-yields have been consistently below 0% since August 25, those for France, Holland, Austria, Finland, Belgium and Denmark dipped below 0% intermittently throughout September.